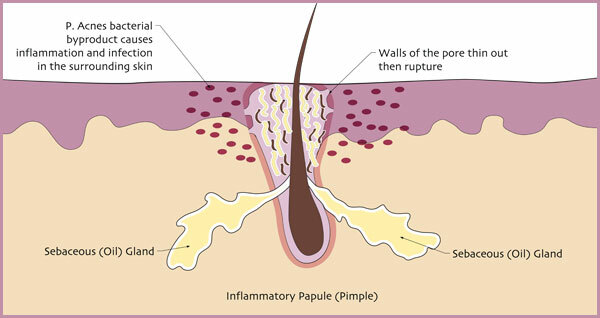 For most people, acne is an inherited condition of the pores. 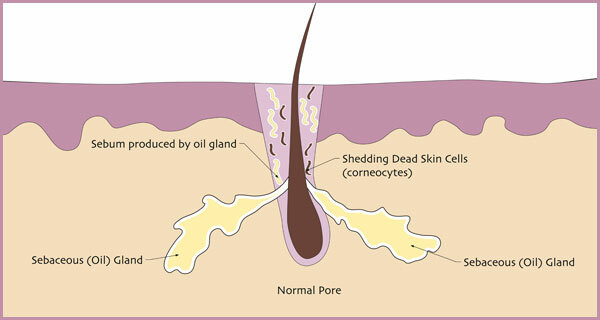 When someone is prone to acne, their pores clog with dead skin cells much faster than normal. Healthy pores shed about one layer of dead skin cells per day inside the pore, but acne-prone pores shed up to five layers of dead skin cells per day. The body just can’t keep up with keeping the pore clear. Technically, this is called “retention hyperkeratosis”–dead skin cells shedding more quickly than the pore can expel them. As the dead skin cells begin to accumulate inside the pore, the cells become sticky and get stuck inside the pore and form a plug. Medically, this is called a “microcomedone”, which is essentially the precursor to all acne. As you can see in this picture, there are more dead skin cells shedding inside the pore. 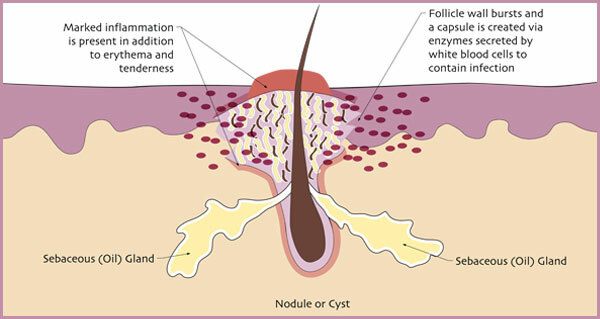 Some people don’t get inflamed lesions, which are often inherited. 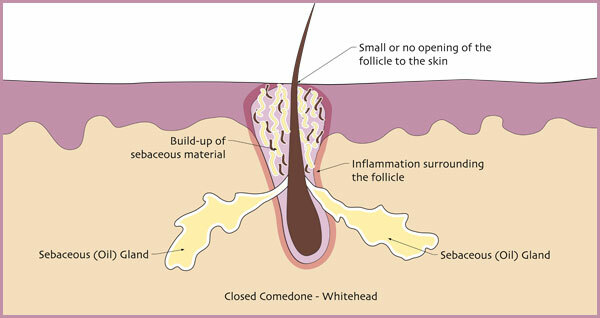 If the dead skin cells and the oil that form the plug don’t become inflamed, the plug becomes a whitehead–a non-inflamed lesion under the skin, also called a “closed comedone”. 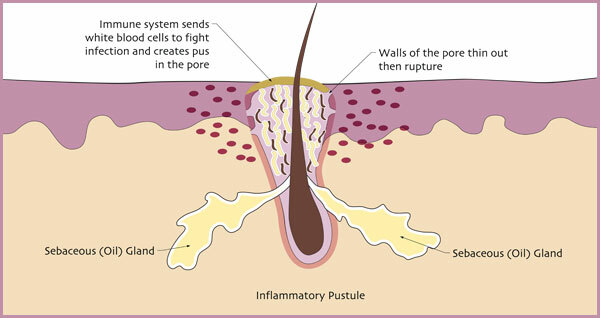 This next drawing shows a pustule, which is different from a pimple only in that it contains white blood cells. When the immune system fights off the P. acnes infection, white blood cells, which are soldiers of the immune system, pile up and create pus in the pore. So you see, acne is primarily an inherited dead skin cell problem. 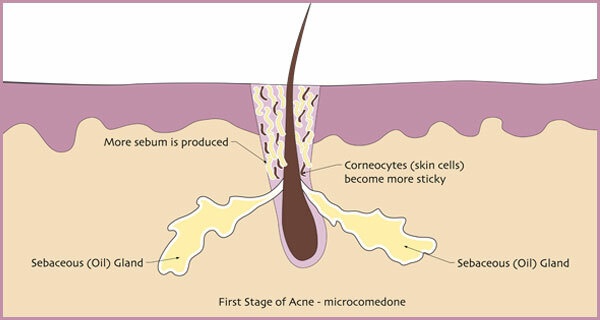 Most acne, no matter what form it takes, starts with microcomedones. This means the solution lies in products that penetrate the pore and prevent dead skin cells from building up. That’s why your home care routine is so crucial. It’s all about preventing the microcomedones (the beginning of acne) from forming at all.